When Schools Get Political, What Should Teachers Do? Rick Hess: Politically, nothing is more potent or poignant than the picture of a child’s face at a hearing or protest. Which is why adults in the system must wield their influence with great care. Hess’s cautionary tale of schools involving students in their political agendas reminded me of my own experience with this institutional practice. Five years ago, I refused to comply with a school-wide political action: the March 4th Day of Protests, a semi-organized demonstration against budget cuts to California public education. While universities saw the most action, Oceana High School stopped instruction and dedicated an entire day to protests and political propaganda. As a teacher, I was troubled and conflicted by the entire exercise. Troubled, because public instruction time and the students themselves were being used for political objectives. Conflicted, because I was a first year teacher who really didn’t want to go job-hunting over the summer again. So, for a period of about 6 weeks, I was constantly faced with the choice: do I go along to get along? Or do I ensure my students are making informed decisions about their use in a political exercise? In late January of 2010, two Oceana teachers proposed that the staff participate in the March 4th action. We were given a “fact sheet” in the staff meeting to read to our students and told to encourage them to volunteer for “student planning committees”. No opposition was expected or given. At the time, I assumed the action would be voluntary and brief—and even on that basis my concerns were non-trivial. But I said nothing. The humanities teachers were coordinating the participation, as they met daily with their students instead of every other day in the school’s multi-block schedule. Each teacher also has a single grade advisory. I had 20 of the approximately 140 freshmen as both my advisory and humanities class, a unique situation. The rest of the students had one of two other teachers for humanities, and one of six other teachers as an adviser–all of whom were passionately committed to the activity. Had my humanities students been randomly distributed among the different advisories, the other teachers would have learned of my perfidy sooner, and the results might have been different. I kept all emotion from my face as I read the fact sheet aloud. My students quickly translated my lack of expression as lack of enthusiasm. “You don’t think we should do this?” someone asked. “I think you should absolutely do this if you want to,” I responded. “There’s another point of view entirely,” I said, and waited. I hoped that would be the end of it. Unfortunately, a few meetings later, I learned that the protest would include off-campus activities, with the kids handing out pamphlets in public spaces. Then we got a mandatory survey. Did we want to participate in a “teach in”, to explain the budget cuts to our students? Protest participation had evolved from “opt in” to “opt out”. I checked the box for “I plan to teach my usual curriculum”, and hoped for the best. A week later, I learned that the entire day was going to be given over to “teach ins”. We humanities teachers were to distribute permission slips for off-campus activities and “push” for their quick return. Students who didn’t return permission slips would have to watch a movie: Walkout, about student political action in East LA. I distributed the forms, reminded everyone that participation was their choice, and didn’t mention it again. In another curriculum meeting later that week, another humanities teacher said, “We’re not even going to be on the campus that morning, since we’ll all be at the beach” before classes start. Oh, by the way, she added casually, I was the only teacher who wasn’t going to do a “teach in”. I emailed a counselor privately, telling her that none of my students were turning in slips, and that I wasn’t sure how I could legally require them to do so. The counselor reassured me: under no circumstance was I to require the students turn in slips. Ultimately, only one of my students turned in a permission slip, saying he “didn’t want to be stuck watching a movie” (score one for activism!). The rest of my students went against the tide. On March 1st, all the freshmen teachers were working on the logistics of having the entire freshman class forming a huge SOS on a Pacifica pier. The entire meeting stopped cold. I was suddenly the target of many narrowed eyes in unhappy faces. “Did you push them?” one of the teachers asked. “I can’t make them participate,” I said. A counselor (not the same one I’d asked earlier) said casually, no big deal, “Of course it’s not required.” and the conversation ended. The news of my recalcitrance spread rapidly. An assistant vice principal towed a brand new humanities student to my classroom during geometry, asking me for a permission slip. This was a very public rebuke, since the office had plenty of blank permission slips. 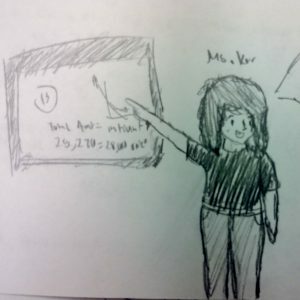 After the AVP left, a freshman from another humanities class said “I heard your kids don’t have to go?” Several other freshmen chimed in: they’d been told the only way they could get out of the event was for their parents to write a letter explaining why they didn’t care about the school budget cuts. The planning meeting was somewhat brutal. Imagine all the school’s teachers sitting in a huge circle of tables, facing each other. Each teacher doing a “teach in” is given a huge curriculum packet in an envelope. Except me. So everyone is in a big circle opening and examining the contents of huge packets. Except me. The day of the protest, word had gotten out among the students. More than one student I’d never seen before asked me why I “didn’t care about schools”. On the other hand, my non-conformers were pretty proud of themselves, while I reminded them constantly that non-participation didn’t mean opposition. One student was kept home by her dad to ensure she wasn’t part of the demonstration. Another mentioned that he’d written a letter of protest to the principal. I read it aloud to the class and encouraged him to send it into a newspaper. His passionate protest led me to document my experiences in an email to Debra Saunders, a well-known local columnist at the San Francisco Chronicle. I didn’t want to go public, but my student was more than willing to share his letter. So the same week that the staff celebrated the mention of our school in coverage of the state-wide demonstrations, Saunders wrote critically of the March 4th event and included quotes from my student’s letter to the principal. Huge thrill for my humanities class, less so for the staff. Several wrote letters responding to Saunders’ criticism. Then Jay Mathews of the Washington Post read Saunders’ column and wrote approvingly of my student’s letter. Another thrill! One of my other top students asked if she could respond to his column and I confess I actively encouraged it, since I know Jay Mathews pretty well (he wrote about my Stanford travails). Jay published Meg’s entire response. So in the space of a week, two of my students’ essays were discussed by nationally known columnists in major media outlets. While this normally would be cause for celebration, it was understandably not mentioned much at the school. Unsurprisingly, Oceana didn’t renew my contract. While my first year included the best moment I’ve had as a teacher–so far, anyway—I’d been convinced as early as September that the school wouldn’t ask me back. We weren’t a good fit. While I’m both certain of and troubled by the fact that the school considered my personal beliefs a factor in the decision, I can’t know if my actions with regard to the protests were a factor in my non-renewal. While Oceana doesn’t seem very different from a typical high school, few comprehensive schools could engage in a similar school-wide political action. Oceana is designated as alternative, unbound by many public school restrictions. But while blatant politicking is rare, all schools—public, charter, private—engage in their fair share of ideological mandates, from anti-bullying week to extra credit for “going green”, that often don’t consider whether the students are giving informed consent to participation. Meanwhile, many students are confusing “I don’t care” with “I oppose”. Avoiding participation becomes their primary objective. If that’s impossible, they become practiced at just going through the motions, rather than finding the internal fortitude to resist. Everyone has the best of intentions. The teachers and administrators at Oceana meant well. So do the schools and teachers Rick Hess refers to, from Eva Moskowitz and all the Success Academy teachers, to the teachers and schools busing Newark students to a protest in Washington DC. So do I. Without question, my actions at Oceana were an expression of values, just as the other teachers and schools were expressing theirs. The difference lies in what we each want our students to do. I want my students to share my values about open expression, and could care less whether they agree with me. Oceana High School and Eva Moskowitz, as well as many other schools and teachers, see no valid alternative to their opinions, and so consider any efforts at “hearing all sides” to be wasted. They see agreement as essential, conflicting opinions as harmful and—I believe as a consequence—don’t really think much about the need for open expression. This is a problem. I’m not sure how we address it as a society in our polarized times. But all teachers should think carefully about their expectations, and whether their desire to create “enlightened” students conflicts with their responsibility to educate students to form their own opinions.